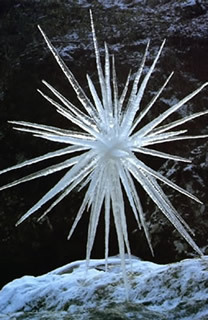 Goldsworthy is well-known for his environmental art; collaborations with the natural world ranging from permanent constructions of found stone or wood to objects and interventions using snow, ice or vegetation. Most of his ephemeral works such as Icicle Star, 2003(left) or Icicles Ilkley Moor, 1979 (below left) are recorded photographically; Goldsworthy very rarely displays objects in gallery settings, so the processes through which they eventually vanish remain implicit and unseen. Occasional public projects have, however, allowed audiences to witness such pieces first-hand. The Midsummer Snowball Project (below, right) involved placing thirteen enormous snowballs around London, UK, at the height of summer in June 2001. Transported from the Scottish Highlands, they were left to melt in the midsummer sun - a process that took five days. As the snowballs disintegrated, they revealed hidden contents gathered at their place of origin: sheep's wool; feathers; seeds; pine cones; berries - traces of one of the most remote regions of Britain left behind for urban Londoners. Brazilian artist Neuenschwander frequently makes use of nature to explore themes such as the fleeting and ephemeral, notions of time, the unexpected and random. The materials she chooses often allude to her homeland. Rainwater, for example, appears in several works, a reference to the torrential downpours of Brazil's rainy season which shape and direct everyday life. 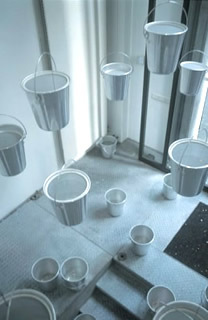 In Chove Chuva (Rains the rain), 2002, (left) twenty-five water-filled aluminum buckets are suspended in air, each with a hole in the bottom allowing the contents to drip into buckets on the floor below. Highly evocative of the rainy season itself, the installation also acts as a rudimentary chronometer as every four hours the buckets have to be refilled by a gallery employee. Yet the incessant dripping also marks a different sense of time, the claustrophobic notion of long confinement enforced by the severity of seasonal storms. In Rain Maps, 2008, (detail left) the force of a storm becomes an active collaborator in Neuschwander's work. A series of fourteen road maps were exposed to torrential rain, the power of the deluge quite literally leaving its mark on the paper by diluting inks and scarring surfaces to create new, uncharted terrain. This Brazilian born, London-based sculptor works with an eclectic range of materials, yet often turns to nature to evoke his central theme of subtle transformation. In Sunset/Seven Seas 2007 (below), sections of colored card are exposed to sunlight until they fade. As well as providing an intriguing association with the 'Sunset' of the title, the transformation reverses the usually negative connotation of fading. Delicate artworks are particularly prone to the damaging effects of light and time, yet here the process is used to create a piece that is subtly coloured by the sun's rays. Nature is similarly employed as collaborative artist in what are probably Lemos Auad's best-known works. 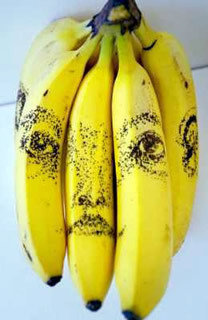 Outlines are first scored into bananas with a pin. Initially invisible, an image emerges as the fruit bruises around the lesions. Over time, the drawings gain in thickness and intensity before disappearing forever as the entire skin turns black. Organic elements such as fruit, vegetables and flowers are a constant feature of Scottish artist Gallaccio's work. Beautiful yet highly perishable, such materials undergo a process of transformation even as they are being exhibited. 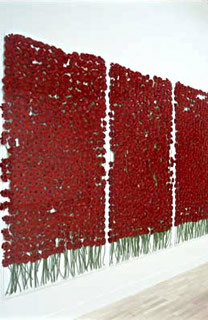 Peruse "beauty", 1991-2003, (left) consists of 2,000 red gerberas that gradually wither during their time on display. Similarly, Gallaccio's 1992 installation Red on Green featured ten thousand rose heads left to decay on a bed of their stalks. The transition involved is not only visual; the delicate perfume of the flowers gives way to the odour of decaying vegetation, a tactic that is also a dominant feature of Because I Could Not Stop, 2002 (below). 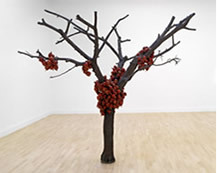 A bronze sculpture of a tree is adorned with aromatic red apples. Initially filling the gallery with delicious scent, as time passes both the sight and smell of rotting fruit associate the work with death and decay. In Gallaccio's hands, ephemeral materials constitute an unconventional yet powerful momento mori, a reminder of the effects of time on things of beauty as well as life itself. Los Angeles-based artist Justin Beal is not primarily concerned with employing natural process, but decomposition lies at the heart of Fruit Tables, one of his best-known series of works. 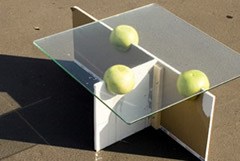 In them, fruit is wedged between a glass pane and simple plinth. The uneven and unstable glass renders the structure useless as a table, valid only as a sculptural presence. As the fruit rots, however, the glass lowers to meet the base, eventually providing the flat surface that allows the work to fulfil its titular function.